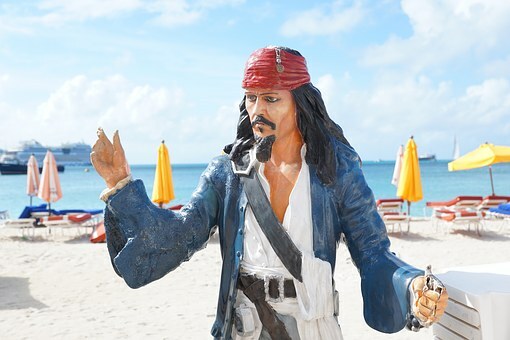 Avast ye, Captain Jack Sparrow’s jewellery has been revealed to be worth a hearty £224,615 ahead of the release of the latest instalment in the Pirates of the Caribbean on Friday (26/5). Valuations by jewellery expert, F. Hinds, worked out how much the buccaneer’s iconic bling would be worth in the real world if recreated as one off pieces. Often referred to as the worst pirate anyone has ever heard of, the jewellery presumably has a questionable origin, however. One of Jack’s prized possessions, and made from sterling silver embedded with a single green emerald stone. This would set you back £4,250, making everyone around you green with envy. This meticulously carved ring would take the skill of a master to create, so the value is in the craftsmanship rather than the precious metals. The design is from the Far East containing a mid-green jade stone, valuing at £750. Assuming this has high gold content, the design feature is a carved gemstone, with a slight red tinge, inlaid with a gold floral design set with diamonds. A lot of skill would go into creating this ring contributing to its overall value. This piece, seen as an antique containing 22ct of gold and high-quality diamonds, would cost £5,500. Whilst in Jack’s possession on his quest to find the chest of the Treasure of Cortés, the weight of the 22ct gold alone adds up to create a substantial starting point for this piece. In today’s world the oval shaped amethyst is relatively inexpensive, but in Jack’s time would have been prized due to its rich purple colour associated with royalty. To reproduce this ring today you would expect to pay around £8,500 making it the most valuable of Jack’s rings. It’s not all about the silver and gold treasure, the leather fashion accessory found on Jack’s wrist is made from worn leather and gemstone beads, taken to any leather craftsman worth his salt, this piece of jewellery could be made into a one-off piece at an affordable price evaluated at £90. Using best quality modern day cultured pearls from the South China Sea, Jack’s pearls would retail around £5,500. The pearls Jack is wearing would have been hand dived for and is incomparable in today’s market. The famous head beads worn by Jack from the very start consists of a red patterned glass beads and various other semi-precious gemstones. The iconic coin at the bottom of the beads is supposed to be a pirate piece of eight, in today’s world it’s a Burmese silver coloured Pya as used in the actual films. You could recreate this for around £25. The typical pirate booty of gold and silver makes up the bulk of the value, Jack’s crown which he stole from the Isle de Muerta is worth upwards of £200,000 and is bejewelled with pearls, blue sapphires and large semi-precious gemstones… luckily for Jack the crown isn’t cursed. This isn’t included in the overall costs of Jack’s jewellery, but it can’t go unnoticed. This treasure chest is jam packed with 882 pieces of Aztec gold coins, valued at over £3,000,000. “Treasure almost seems to be the first thing people think of when it comes to pirates, with Jack Sparrow, it’s no exception. “We thought that ahead of the release of the new film we could have a bit of fun by using our expertise in jewellery to work out how much just how much Jack’s personal collection is worth if you tried to reproduce it . “He’s often deemed as the worst pirate anyone has heard of, but owning a £200,000 crown he is quite possibly one of the wealthiest.